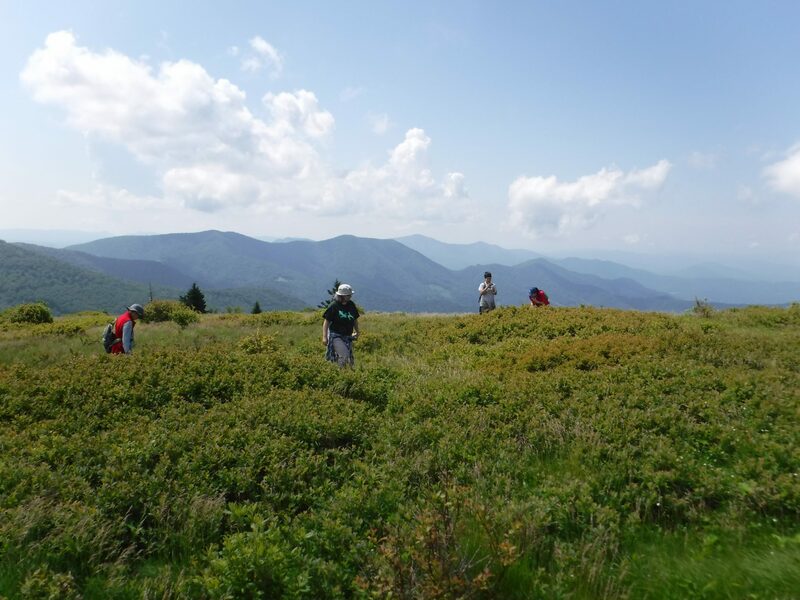 Our Search for the Rusty Patched Bumble Bee continued on Sunday, June 17th on the beautiful balds of Roan Mountain along the North Carolina/Tennessee border. 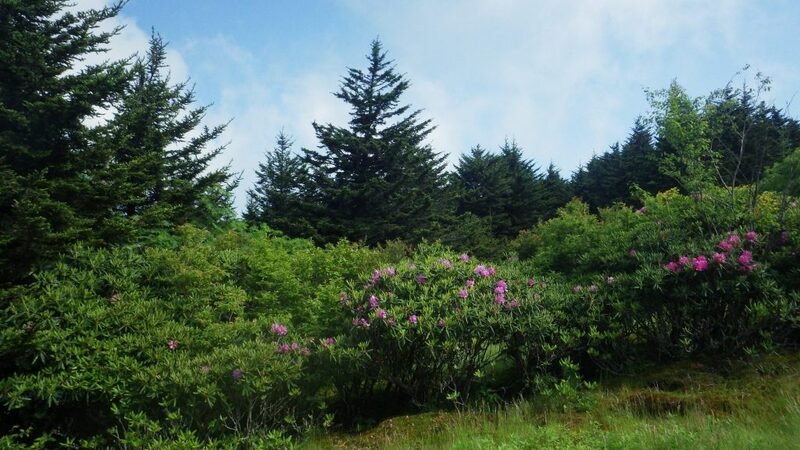 The Rhododendrons were in full bloom, and the Rhododendron festival was in full swing attracting hundreds of visitors and thousands of pollinators to the flowers that the festival is based around. 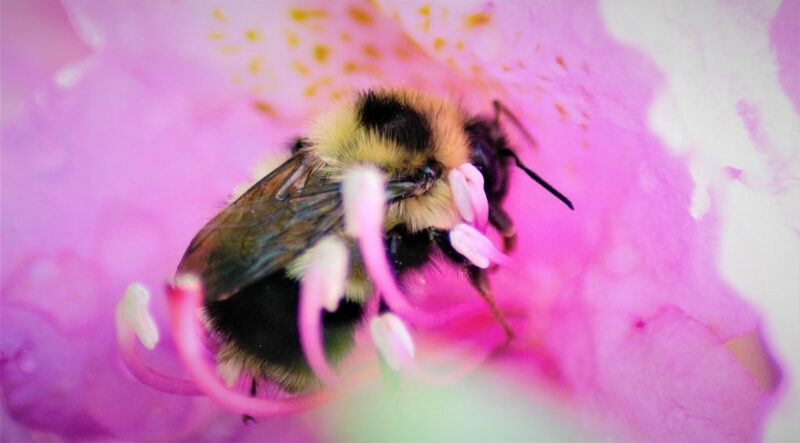 Bumble Bees filled the air from the moment we began our hike, surrounding citizen scientists and biologists alike with burst of yellow and black in the midsts of flowering fuchsia-colored Catawba Rhododendrons. Nearly every flower had at least one Bumble Bee darting in and out as they gathered and spread the pollen it takes to support so many flowers. With their overwhelming selection, the Bumble Bees moved slowly, as if the abundance of nectar was getting to their heads. For us, it offered valuable practice time as our citizen scientists mastered the technique of gently capturing Bumble Bees in their jars and focusing their lenses to get clear photos. These photos can then be uploaded to iNaturalist where experts from all over the world can provide identification for each of the several species we observed. 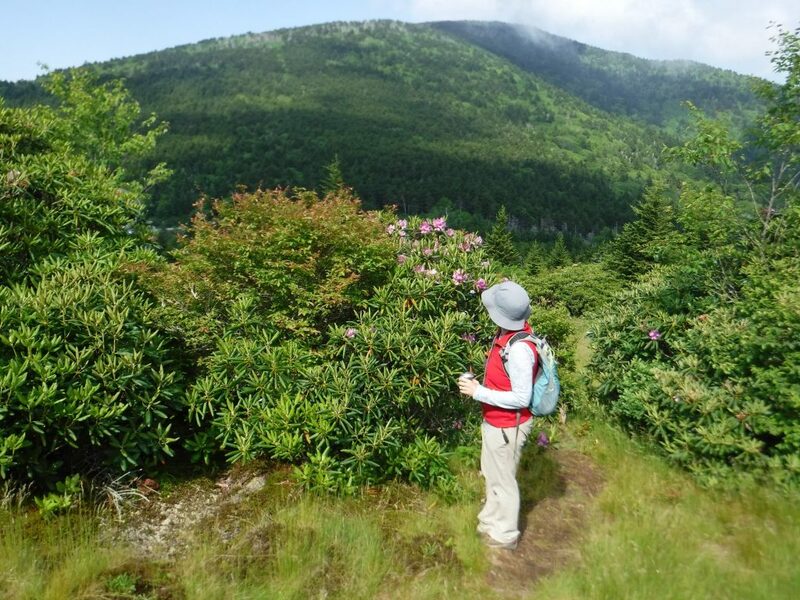 We walked slowly as it was impossible to cover much ground while taking in gorgeous views of the Roan Highlands and stopping when we heard that distinctive hum of Bumble Bees. Soon enough, we reached the summit of Round Bald and could take a full look at the largest stretch of Grassy Bald in the Appalachian Mountains. Over 1,000 acres of wildflowers, grasses, and cool breezes make for Bumble Bee heaven. We continued our walk as the pink rhododendrons gave way to blooming flame azalea, speckling the landscape with explosions of yellow and orange. The Bumble Bees made the most of these blooms and interspersed their foraging with visits to the occasional blueberry bush whose flowers remained this late in their season. This transition from spring to summer blooms emphasized how dependent Bumble Bees and other pollinators are on a constant supply of native flowers. 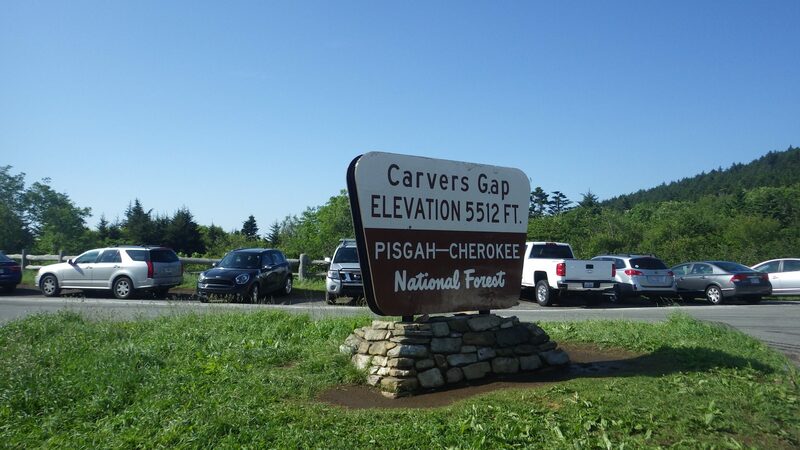 Cherokee and Pisgah National Forest converge at Roan Mountain, providing a protected space for these pollinators and the people out searching for them. 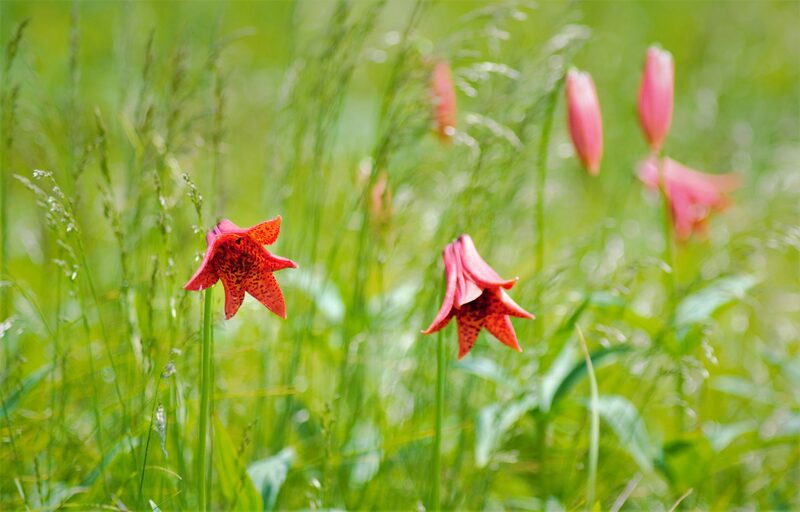 This protected space has paid off, creating an environment that can support even the rare and delicate Gray’s Lily, a flower at risk of fungal infections that can be spread when the flowers are picked and transported. Seeing these blooms in their natural habitat reminded us how important it is we work together to protect the vulnerable species that are all too common in our world today. A place that can support rare flowers can also support populations of declining Bumble Bees. 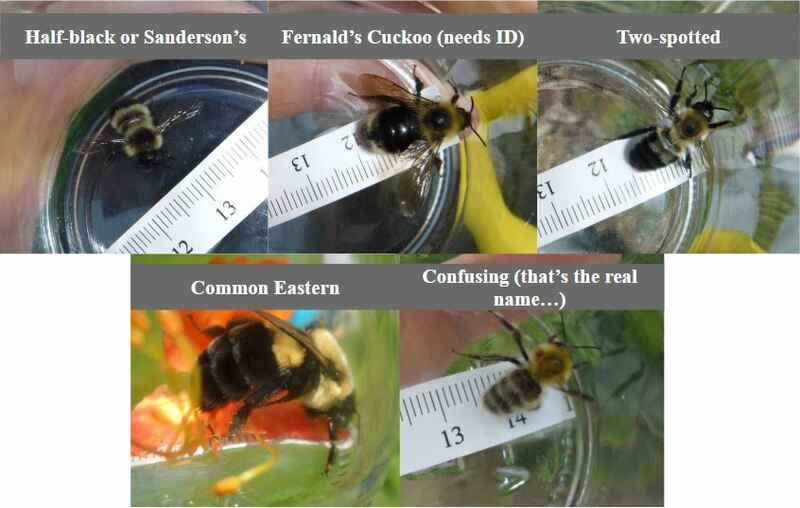 Thanks to our citizen scientists, we were able to capture at least five different species of Bumble Bee (potentially) including a species new to our iNatuarlist project, the Confusing Bumble Bee (Bombus perplexus)! Our volunteer citizen scientists proved invaluable on this trip, finding three more species than the trained biologist leading the hike. Having the support of volunteers like you really does help us find species that we would never be able to find on our own! Help us help the Bumble Bees by joining our project and coming with us our next hike!